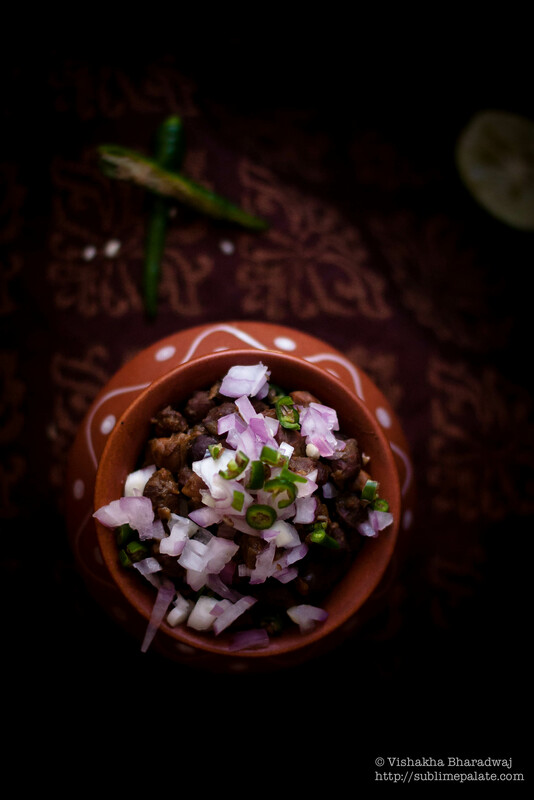 The inspiration for this recipe comes from the big fat Indian feasts that happen in the Eastern state of India, Bihar. For most special occasions in our family home in Bihar, we outsource the cooking to a local caterer who has an army of cooks working for him. They come prepared, set up their temporary cooking stations in our big open backyard, slowly the gigantic pots and pans start coming out followed by jute sacks filled with fresh produce like onions, potatoes, pointed gourd (Parval) and other ingredients for the big feast. If you are as crazy about food as I am, you’ll quickly realize that it is such a treat to watch! These seasoned cooks operate with ease, often engaging in a friendly banter, the topics covered range anything from the current price of locally sourced onions to the fate of the country post elections and sometimes world peace! Their efficiency and skill is beyond doubt, exceptional! The one thing that I am always in awe of is how they estimate spices & salt when handling such large quantities of ingredients. There is no madness like you would normally witness in a commercial kitchen, even though the menu is usually quite extensive. The preparation and cooking is flawless and the food just seems to magically come together, on time! Of course, what we don’t see are the years of practice, planning and time management skills that have gone in to what seems like an effortless pursuit. 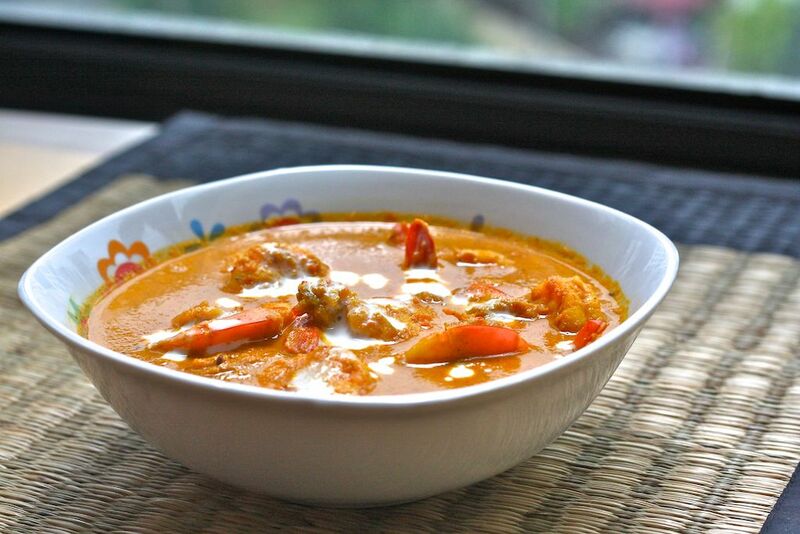 I took inspiration from the pointed gourd curry which I have had on many such occasions. The use of Kashmiri and Deghi chilli powder (easily available on amazon or your Indian stores) imparts a nice red colour as well as heat to the curry. I like to add a little yogurt in this curry which helps balance the heat from the chilli. The addition of yogurt to this dish may not be traditionally done, but I like the hint of tang and creaminess that it lends to the curry. Also please note that, traditionally, the potatoes and pointed gourds are deep fried. 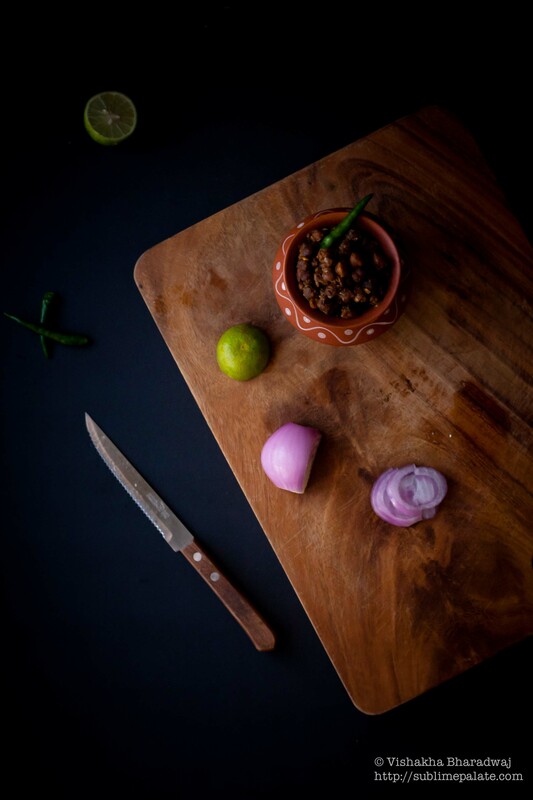 I am always on the look out for adapting traditional recipes to a more balanced form so that I can maintain their nutritional value, taste and ease of cooking. That totally does not mean that I never deep fry stuff or you shouldn’t either. Everything in Moderation – that’s my food mantra! Potatoes – 2 medium sized Golden potatoes (Bought from Asian store). Boiled firm, Cooled, Peeled and cut in large cubes (Keep cubes are similar in size to the pointed gourd). Pointed Gourd (Parval / Potol) – 16-20 small pcs of tender, fresh pointed gourd. I do not discard the seeds if the pointed gourd is tender. Trim the ends, scrape it unevenly with a pairing knife and cut into halves.If the pointed gourd you get is bigger in size, cut them into 4. This will also reduce your cooking time in the final step. Onions – 1 medium sized (I used Red onions from the Asian store, you can use yellow onions as well). Makes ¾ cup of this onion paste. Tomato – 1 ½ roma tomatoes. I didn’t have those so I used 3 relatively big size cherry tomatoes (as in photo). Make it into a puree without adding water. It should yield around ½ cup of paste. Heat a heavy bottom pan (wok/kadhai). Once hot, add 1 tbsp of mustard oil. Let the oil reach smoking point, then reduce heat and begin cooking. Next goes the onion paste, a pinch of salt, sugar and turmeric. Cook this mixture on medium-low heat. Once the onions start to lose its moisture it will become brownish. Continue to fry until it looks dry and comes together. Next, add the ginger+garlic+chilli paste. Fry on medium-low heat until all the raw smell of the masalas are gone and the masala looks dry-ish. Add more oil, if you need to. Or sprinkle a little water to prevent burning. Now add the tomato paste. Stir to combine and fry until oil separates and the raw smell of the tomatoes is gone! Meanwhile, since our masala (above) will take a good 15+ mins to come together, I make use of that time by preparing my vegetables. Heat another heavy bottom pan to lightly sear the vegetables. Once the pointed gourd is done, take them off the pan and keep aside. Repeat the process above with the cubed boiled potatoes but since our potatoes are already boiled, it should be done very quickly. Keep aside. 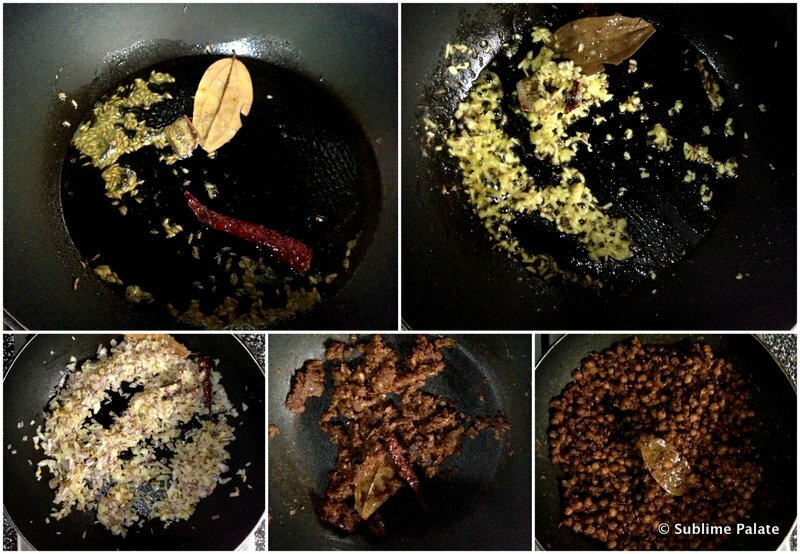 On medium heat, add the prepared Pointed Gourd (from Step 1) to the prepared Masala in Step 1. Let this cook for a good 7-8 mins. Now add the Potatoes (from Step 2) and stir for another minute. Add 2 cups of hot water. Let it come to boil, then cover on low-medium heat for about 15-20 mins. 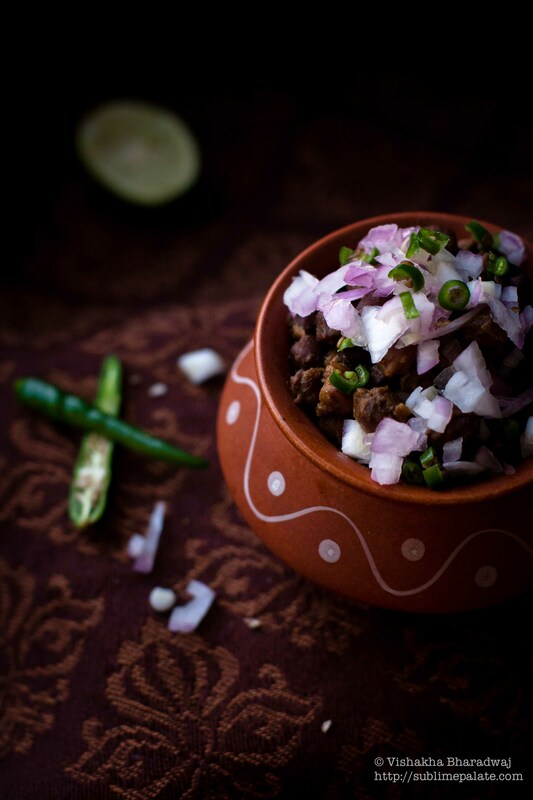 Stir every 5 mins and cook this curry until the pointed gourd is cooked through. It should be soft and not crunchy. 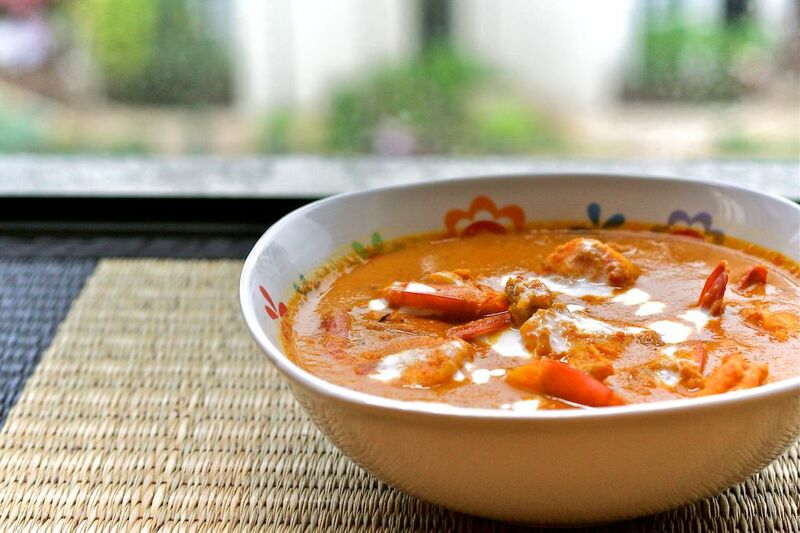 The curry can be of medium thickness but also note that if you keep it in the fridge, the curry thicken as it rests. 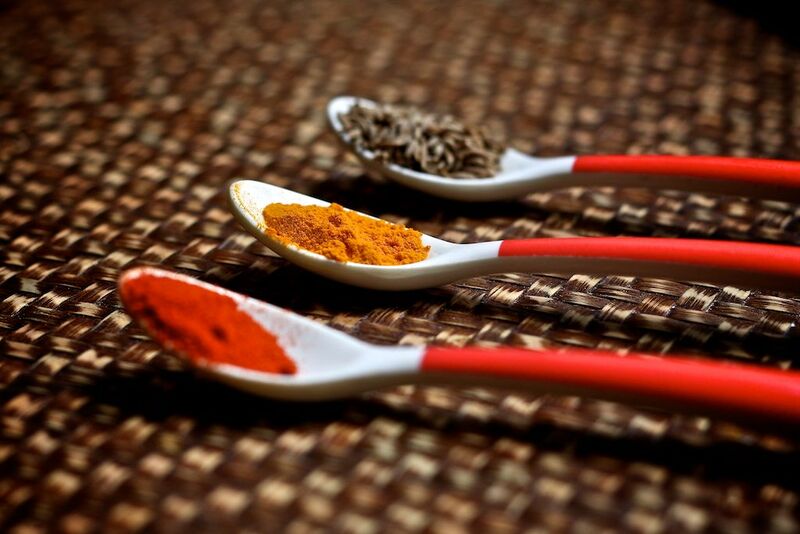 When the curry has reached it’s desired consistency, finish it with a generous pinch of Garam Masala Powder and Ghee. Stir to combine. Remove from heat. An optional finishing touch is to add a final tadka of dry red chillies and some more chilli powder in ghee. 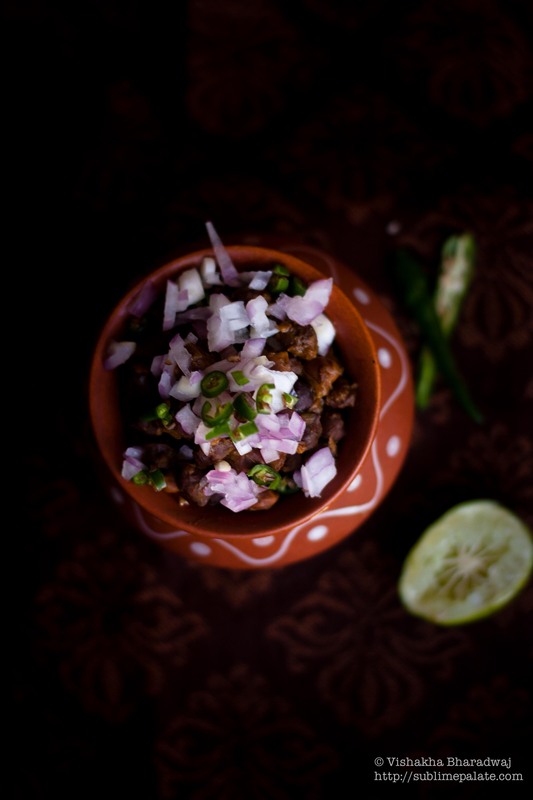 I do that sometimes to finish the dish and for some added colour and heat.Relish this spicy curry as a main course for a weekend meal or a weeknight meal with Roti / Rice along with your favourite Dal (lentils). 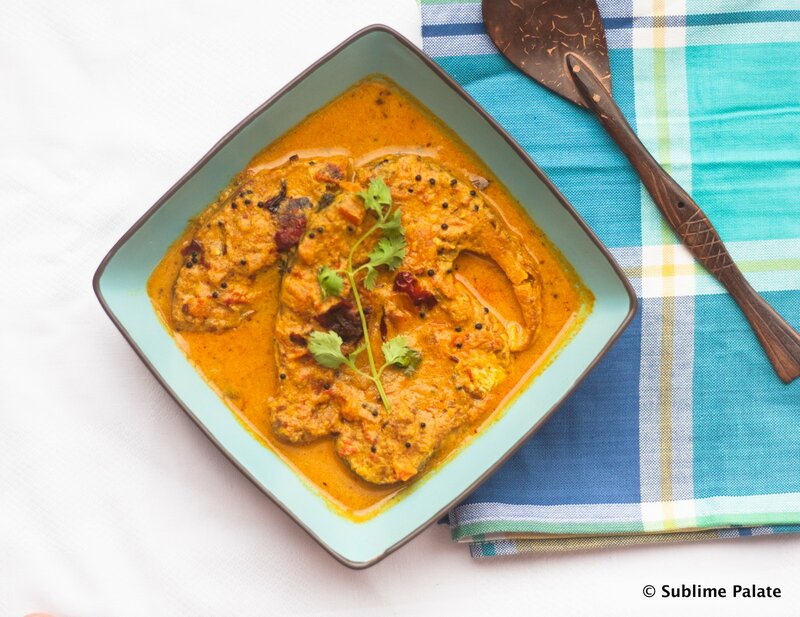 For best results, prepare this curry ahead and let it sit for a couple of hours before serving. This keeps well in the fridge and in fact it tastes even better the next day! In Bihar, we relish the left over curry the next day, as a side with Chooda (Flattened rice flakes), Dahi (Yogurt), a tiny pinch of salt and green chilli on the side. This is a very popular breakfast in Bihar! Family reunions are a very special event and one that I always look forward to. And when we reunite, a sense of dé·jà vu sets in. No matter how old I grow, I become that little girl that my parents nurtured. I feel like I am ready to take on the world and pursue my dreams, knowing that if something goes wrong, I will always have their unconditional love and support to get me through it all. That is perhaps the reason why the most secure place in this world is still in that warm and affectionate embrace of my Mother. Many a times we have disagreed and quite vocally so. She is a bad listener, I often complain. Yet, she is my best friend. A soul mate. She hears without listening. She speaks without speaking. Her eyes tell a story. The story of her life. A life of sacrifice. A life of giving. A strong woman in the inside and so fragile outside. I can never forget an incident from the time I was thirteen. I waited outside my school for hours but Ma didn’t show up. Upset and angry, I mentally rehearsed the conversation I planned on having with her when we meet. Instead, my Uncle appeared. We were headed in a different direction. When I enquired about Ma, he quietly whispered ‘She is in the hospital’. My heart sank. At one point, the doctors wanted to amputate her legs. She refused. She demanded to be transferred to another hospital. Thanks to the doctors, her will power and fighting spirit, she averted the amputation. For her family. And most importantly, for her children. After a painful 3 months in the hospital, she finally returned home. Like a baby, she had to learn to stand and walk all over again. At times she would break down saying she will never be able to stand on her feet. And the next moment, she would get up fumbling but trying harder than ever before. Many months later, she walked. Slowly but surely. And she hasn’t stopped since. It’s Mother’s day on the 13th of May. I dedicate this post to my Mom, who means the world to me and my family. 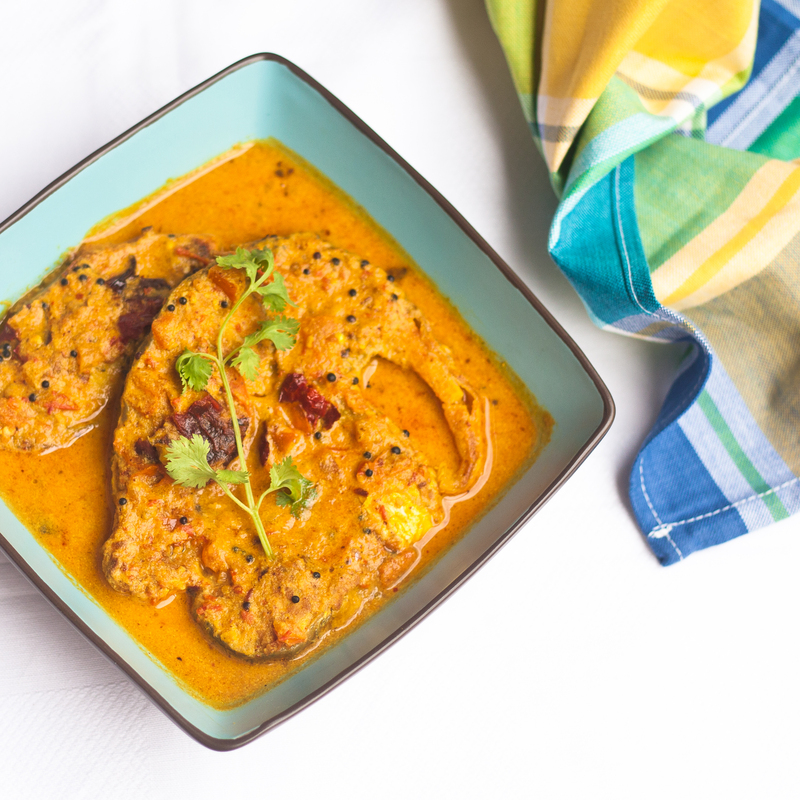 Today’s recipe is a family fish curry which was handed down from my grand-ma but every woman in our family has her own version of it. This is my Mom’s. Tomatoes: 1 big, ground to a paste. ½ a tomato chopped finely. 1. 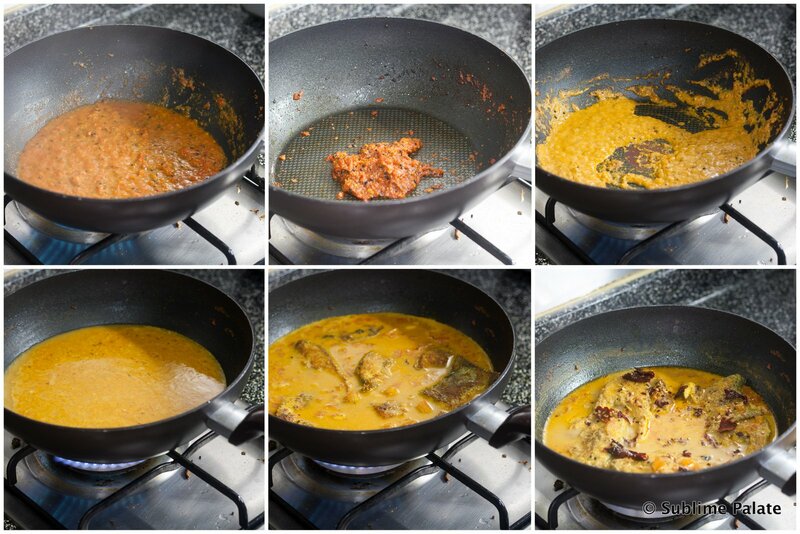 Take ¼ cup warm water to mix together 6 tbsp of mustard powder (2 for frying the fish and 4 for the curry). Leave aside for 5 mins. 2. Rub 1/3 of this mustard paste along with garlic paste, turmeric, flour and salt (see ingredients under ‘for frying the fish’. Let it rest for 15 mins. 3. Heat 2 tbsp of oil in a flat nonstick frying pan. 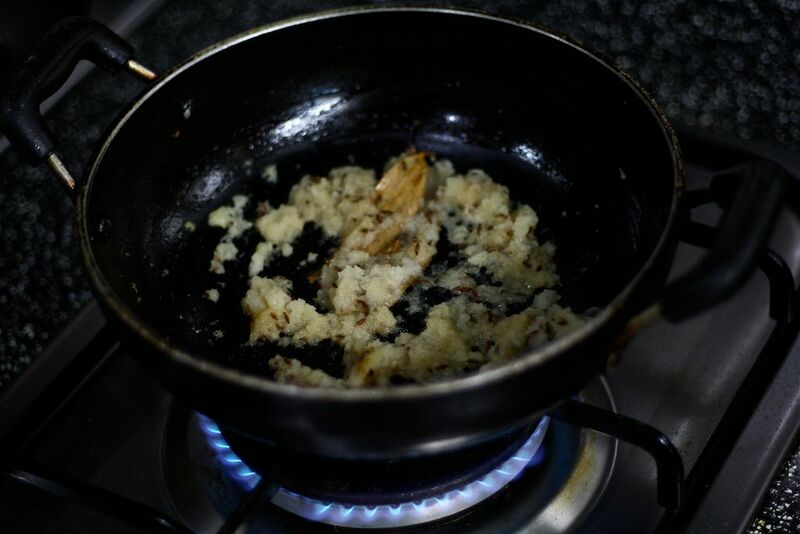 Once the oil starts smoking, remove from heat. Let it cool for 30 seconds. Then add the fish pieces frying it on medium heat until it turns slightly brownish. The fish pieces will also cook in the curry later so do not overcook the fish. 4. In a non-stick kadhai / deep bottomed pan, add 1 tbsp mustard oil. Once the oil starts smoking, let it cool off a bit before adding the black mustard seeds (rai) and the dry red chillies. (Note: I added the dry red chillies but took it out once it was done before moving to the next step as I was also making it for my little one. If not, leave the dry red chillies in and continue to the next step). 5. Add garlic paste. Fry for a minute on low heat. 6. Add tomato paste, turmeric, red chilli powder and salt. Fry on low-medium heat until the tomatoes are fully cooked and form one mass. (about 7-8 mins). 7. Add the remaining mustard paste. Cook for about 2 mins. Do not overcook the mustard as it can turn bitter. 8. Add 3 ½ cups of warm water. Bring it to a boil. Let the curry boil on low-medium heat, covered, for another 7-8 mins. Adjust salt if necessary. 9. Gently slide in the fish pieces and the chopped tomatoes into the curry from the sides. The curry is supposed to be of thin consistency. Adjust water to your liking but always add hot water to make sure the cooking process doesn’t slow down. 10. Continue cooking uncovered on low heat for 5 mins before turning it off. (I added the dry roasted red chillies at this point). 11. Let it rest for about 10 mins before serving. This step will make sure that the fish pieces absorb the curry. I cooked this with ‘Sunrise’ mustard powder. It is quick and hassle free. The only downside is that it isn’t so easily available. I usually stock it up when I go back home. You can use other commercially available Mustard powders. 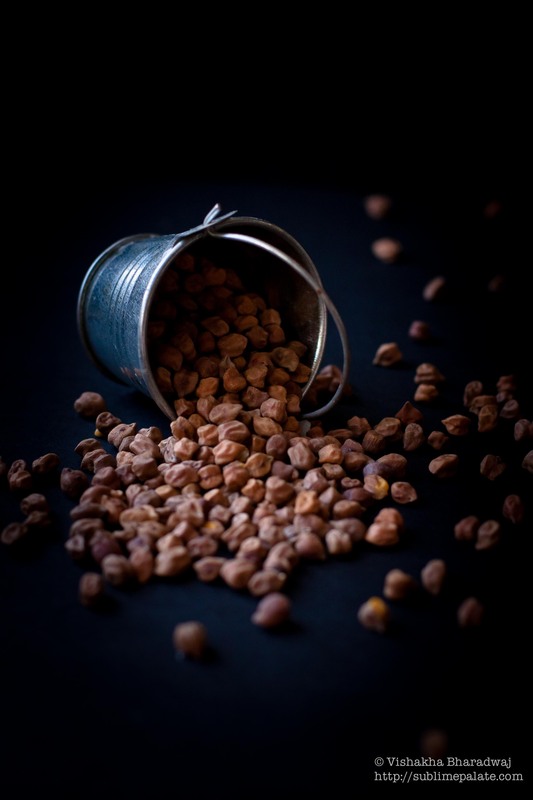 If you have a powerful grinder, you can use that to make fresh mustard paste. Soak 3 tablespoon of yellow mustard seeds + 3 tablespoons of black mustard seeds for 30 mins in warm water. Add the mustard seeds, 2 green chillies and salt and grind to a paste. Do not grind for too long as it can make the mustard paste bitter. Back home, this is usually made with Rohu. 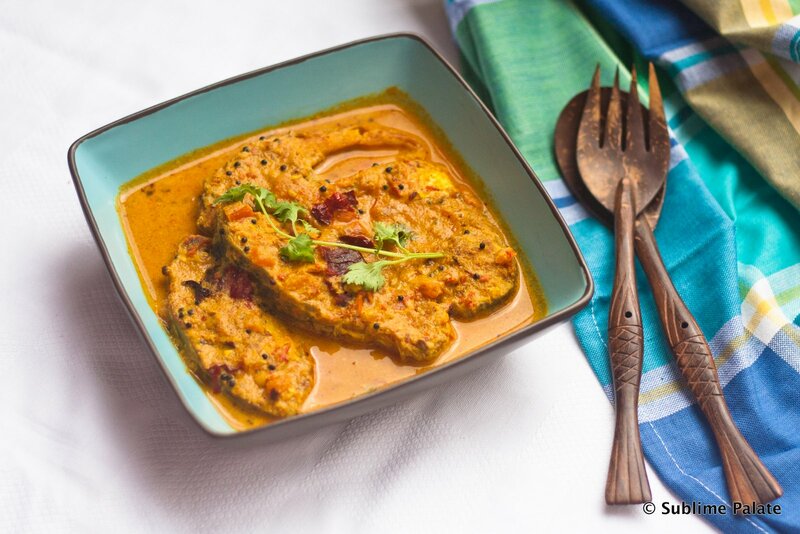 I prefer to make this curry with Seabass as fresh Seabass is easily available here. It has less bones and tastes great! A close friend ‘D’ had a sudden craving for Prawns. Not just any prawns. 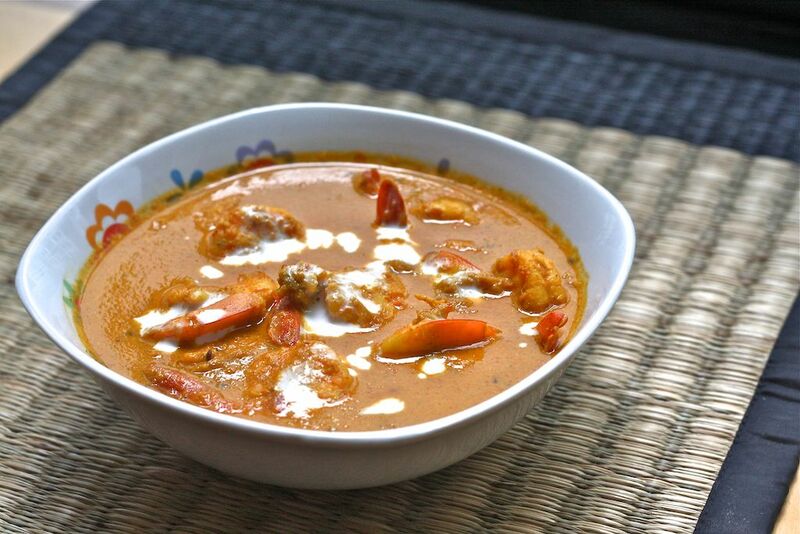 It had to be Prawn Malai Curry. I didn’t really know how to make it. But the sheer opportunity of making something new excited me. I was more than happy to cook, if only I knew how. In less than 24 hours (from what I recall), I got the recipe from his mother straight into my inbox. This is D’s grand mother’s recipe. 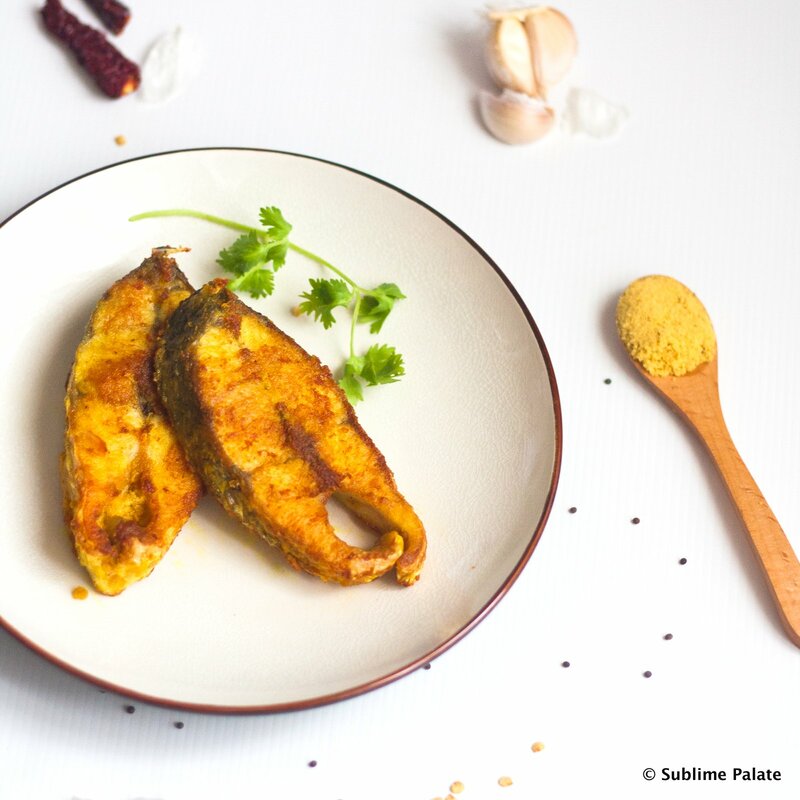 This is an authentic Bengali recipe and one that I have made many times now! Thank you aunty! Step 2 is the cleaning up.. And that is R’s forte. After the prawns come home, R spends a good amount of time cleaning it up thoroughly! You do realize that when I wake up… lazy… all of this has already happened ! D & R really go all the way to make it happen. 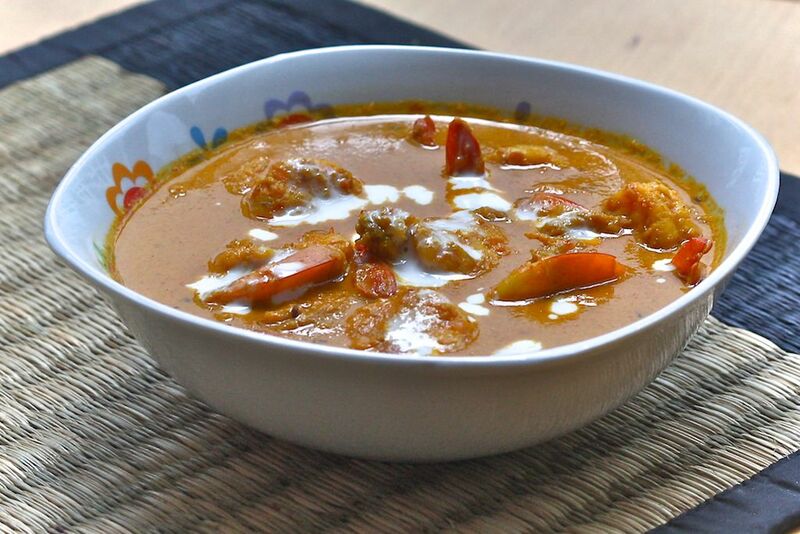 I see the fresh and clean prawns… waiting so eagerly to be soaked in the most amazing coconut cream curry ever! 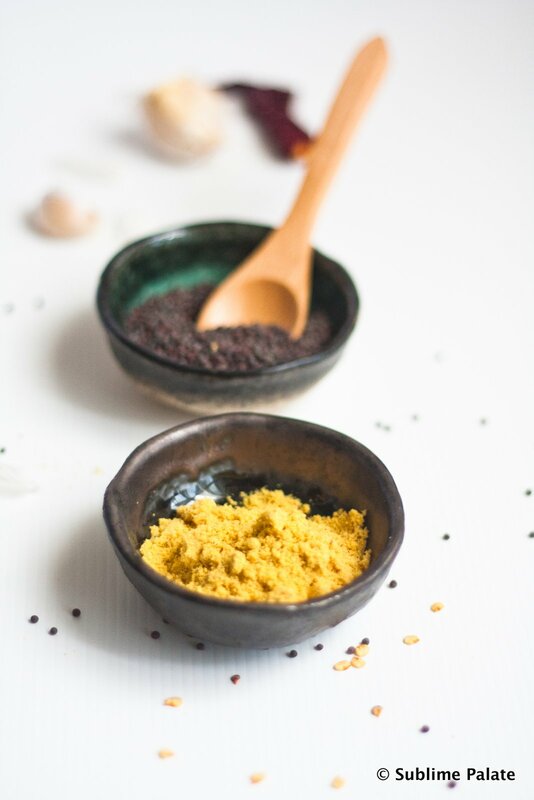 This is one of my most treasured recipes simply because it is one recipe that has no age or spice boundaries… It has been loved by my 2-year old son as much as it has been appreciated by Indians and by non-Indian friends alike. King Prawns: 500 gms – the bigger the better! (smaller prawns are also fine) – The prawns in this picture are from the local grocer.. which reminds me haven’t had a feast in a while! Coconut milk: 1/2 cup. I vary this depending on my guests’ spice tolerance level. If I want a more authentic and spicy taste, I stick to 1/2 cup. However, sometimes I add more coconut milk when I need to tone down the spice. Wash, de-vein, clean prawns. I like to remove the head and the vein but leave the tail behind. 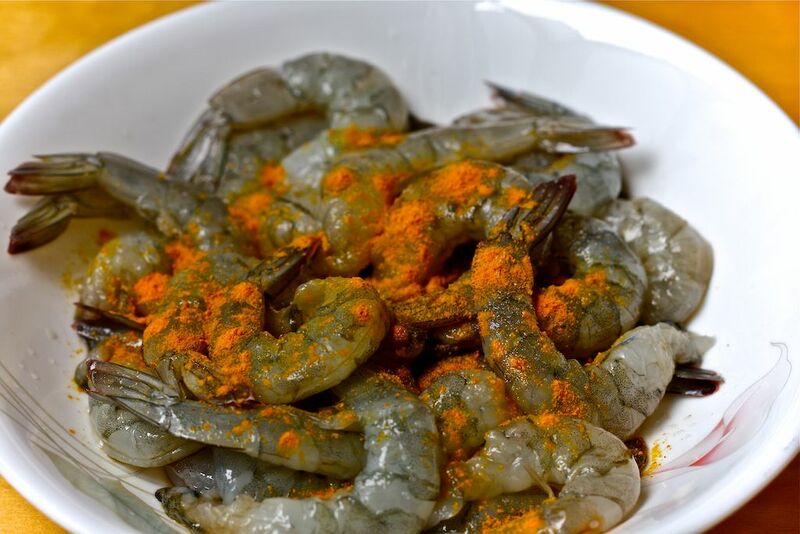 Put 1/4 tsp of turmeric powder and sprinkle a little bit of salt on the prawns. 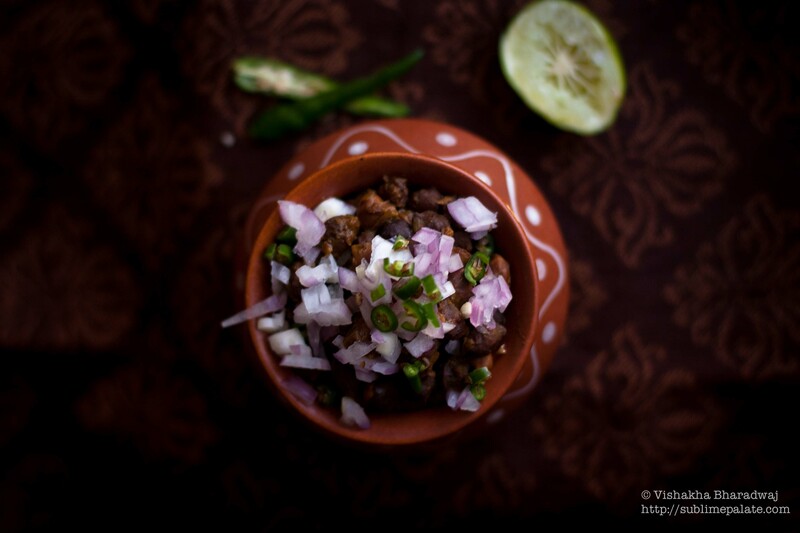 Mix this gently and keep it in the refrigerator until the Masala is ready. Use a heavy bottomed pan to cook this curry. Add oil. 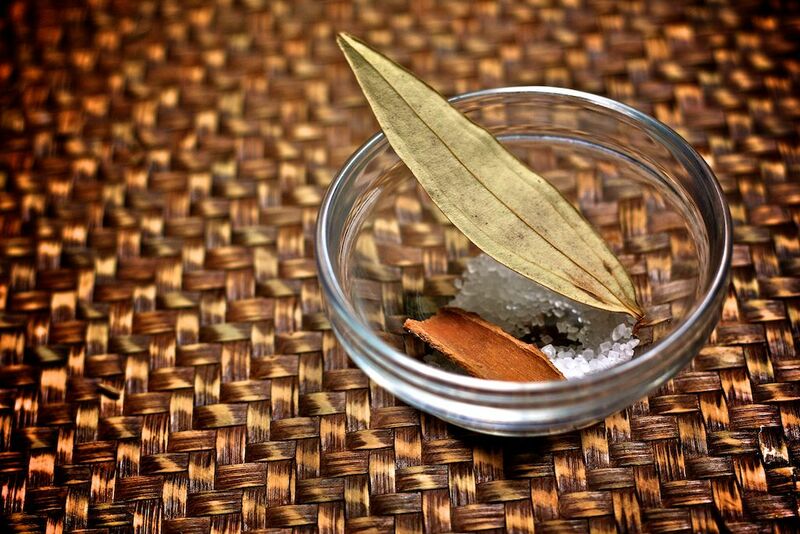 Once hot, add the bay leaf, cinnamon stick, sugar and cumin seeds. Let the cumin seeds crackle for about 10-20 seconds. Add the onion paste. Fry this until it turns brownish and sticks together as lumps. Do this on low heat to avoid burning. This may take 10 to 15 mins. 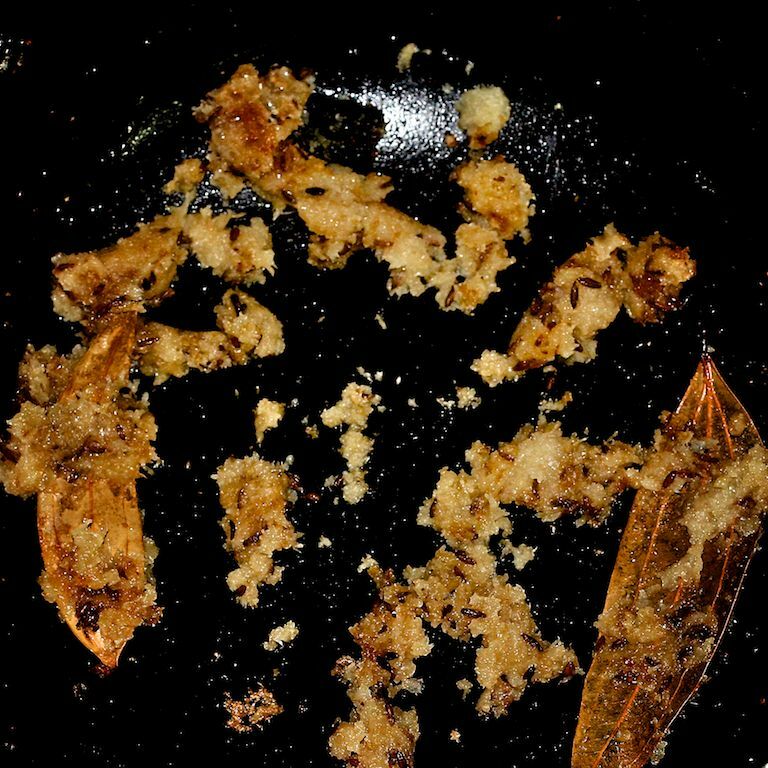 To this fried onion paste, add the ginger paste, garlic paste, turmeric, chilli powder and salt. Fry this for 1-2 minutes until it is cooked and blends in with the masala. 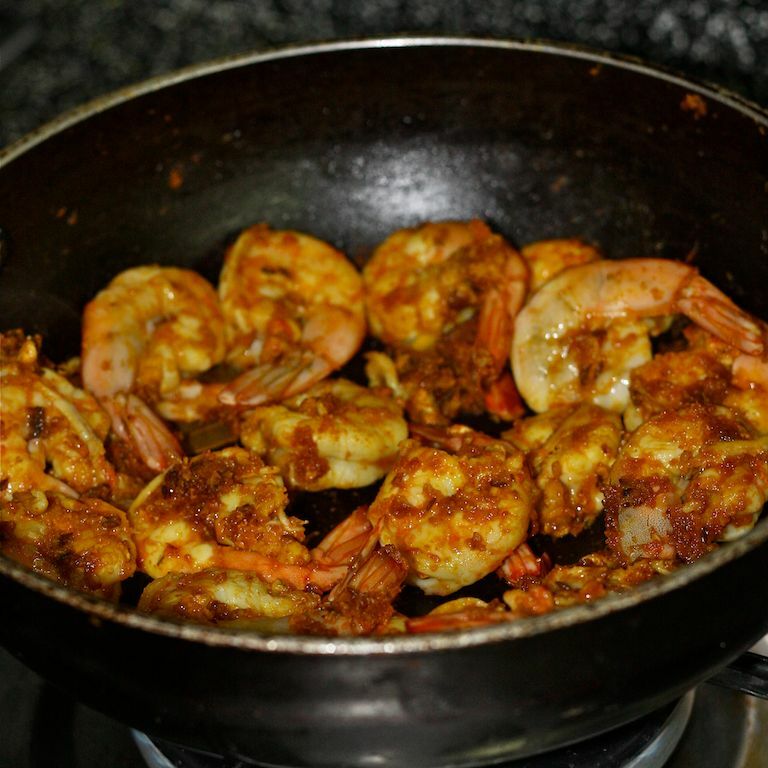 Take out the pre-marinated Prawns and add it to the masala now. 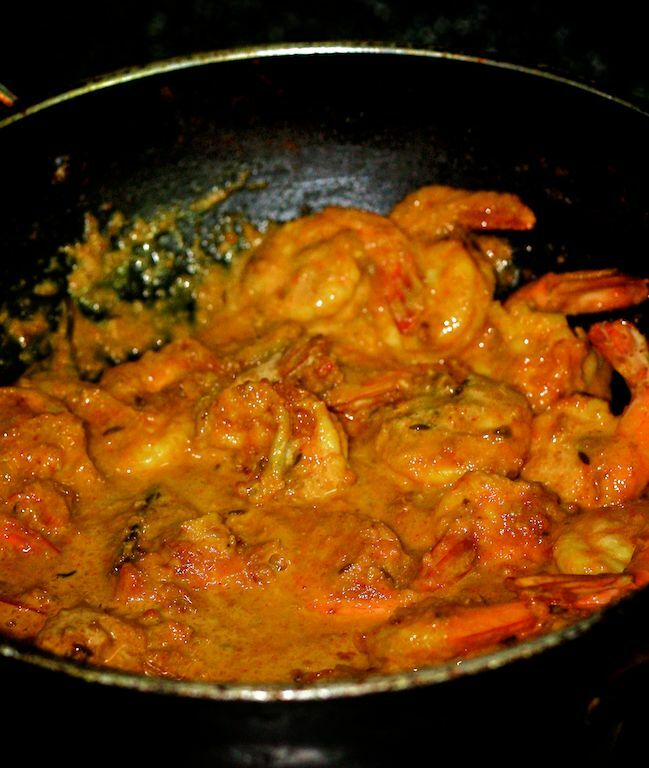 Stir this to ensure that the prawns are coated well with the spices and the prawns turn a nice pink/brownish color. (2 to 3 mins). When the prawns turn pinkish, add the coconut milk. 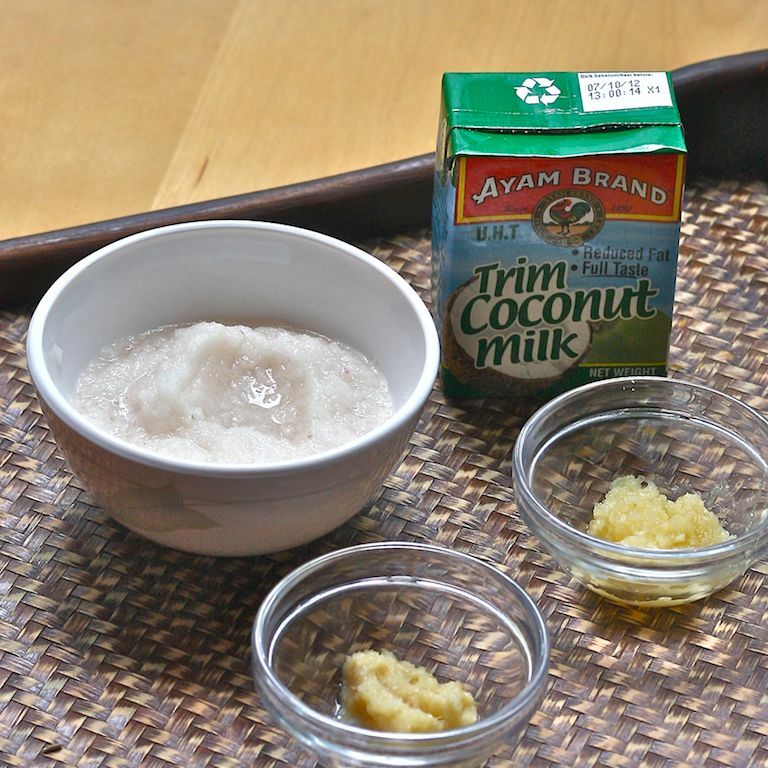 If you are using thick coconut milk like I did, you should add 1 cup of warm water along after adding the coconut milk. This curry is about your preference of coconut and spices. 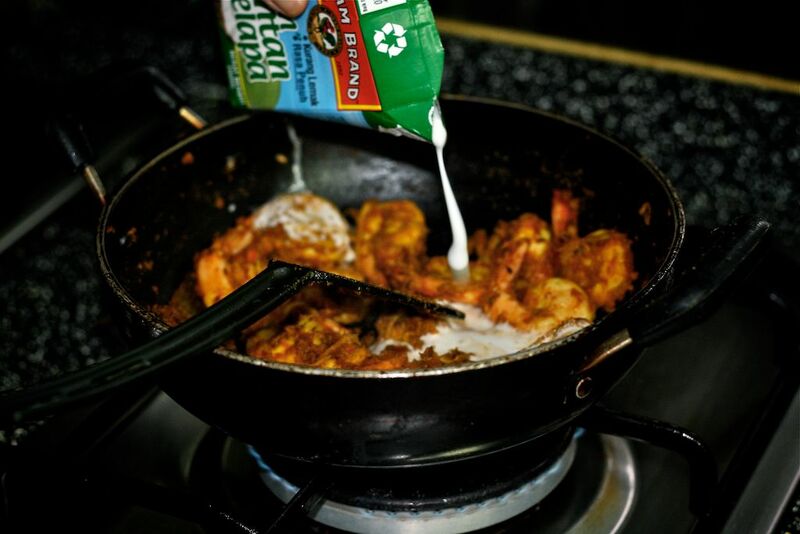 Remember that we have added sugar earlier, prawns are naturally sweet and coconut milk is also sweet. I strongly suggest you go slow on the coconut milk and taste it before adding more coconut milk. If the gravy is thick, add hot water into this to bring it to the right consistency. I alter the quantity of coconut milk and water to suit the palate of my guest. Add some garam masala powder (a spice mix readily available in an indian grocery store) to this curry now. 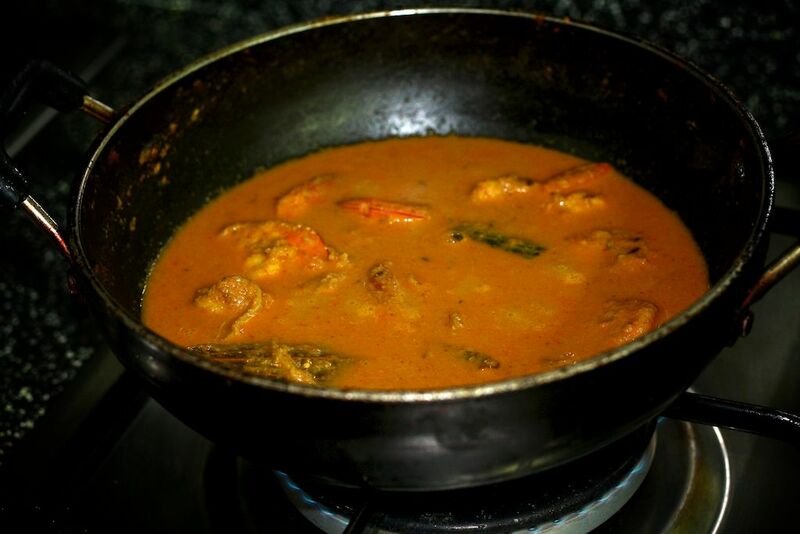 Let it cook on medium heat for another 7-8 mins until the coconut milk is cooked and comes together with the curry. Prawns cook really fast, so make sure you don’t overcook them.